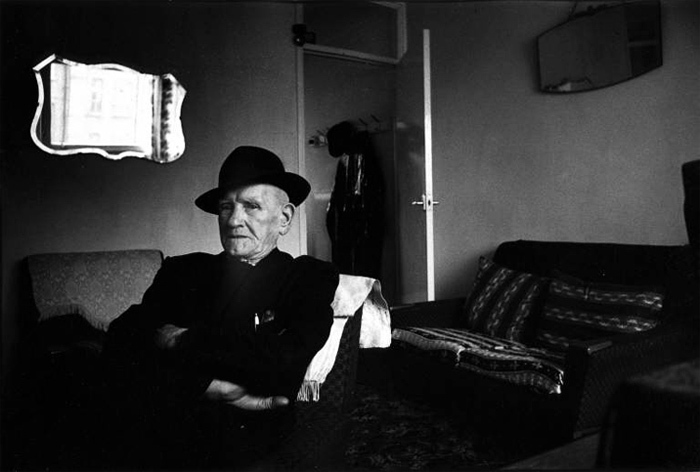 Elderly resident, Pepys Estate, Deptford, 1970. Photo Tony Ray-Jones © RIBA Library Photographs Collection. Like a lot of council estates that have been subjected to the ministrations of ‘regeneration’, there are certain myths about the Pepys Estate. Each has a grain of truth, each covers up what ought to be a larger, more overwhelming truth. My own experience of the place is fairly limited. I recall walking there from a flat in the centre of Deptford to hand in my form for the council waiting list; on a few other occasions I would wander over to use the bridge that connected the estate to Deptford Park, just for the fun of it, for the fact of its mere existence. The place seemed quiet during the day; I only saw it at night as the N1 bus looped around it. So I can’t offer much insight into what it was ever like to live there, but I have watched the material transformations of the place over the last decade or so, and watched the media discourse around it spin its web. The Pepys is often presented as a monolithic, monstrous estate that was a failure from day one. Which is interesting, as the place marked one of the earliest council schemes to preserve as well as demolish – the little enclaves of Georgian nauticalia that mark the estate’s edges were part of the scheme, renovated and let by the council as an integral element, by now surely long since lost to Right to Buy. The rest of it is, or rather was, a series of jagged, mid-rise blocks connected by walkways, enclosing three towers and a large open space, with the bridges eventually leading to a park on the other side of Evelyn Street. In the middle is a community building with a bizarre, expressionist roofline seemingly partly based on oast houses (but then, so is Bluewater). What is undoubtedly true is that parts of it were badly made – the lifts were apparently prone to breakdown from extremely early on. The draughty blocks were clad in plasticky white material at some point in the 1980s. Yet what happened when the place got ‘regenerated’ is by far the most dramatic aspect. The open space went, with low-rise flats to be sold to ‘key workers’ and on the open market taking an already highly dense area and making it more so. This accordingly makes it more ‘mixed’, ‘vibrant’ and ‘urban’, as professionals now live alongside – well, not quite alongside, but at least near to, council tenants. The bridge over Evelyn Street went also, with remarkably clumsy ‘eco-flats’ (you can tell this, because the extra layer of curved glass on the façades a few feet from the actual windows could surely have no other possible functional justification) built where it met the park. This ‘recreated a street pattern’ in the area according to planning ideologists; or it defaced an area of public space. As you wish. The new blocks are regeneration hence good, the old are council housing hence bad. Yet the council flats are much larger, and look much more robustly built, of concrete and stock brick – the newer flats are clad in the ubiquitous thin layer of brick or attached slatted wood, materials which have shown an unfortunate tendency to fall off. The major story is with one of the three towers – the one nearest to the river, naturally – which was completely cleansed of undesirables and sold instead as Z Apartments, luxury riverside living. It became a brief cause celebre via class war reality TV show The Tower. All this, in theory, funds the regeneration, meaning in this case the cleaning and patching up, of the older buildings, or alternatively to their phased, currently seemingly stalled, demolition. None of the new buildings in the Pepys Estate – or anywhere else in London – have been council housing, though its regeneration has entailed several once council flats going private. The waiting list, nationally, is reckoned to be five million. … for The London Column. © Owen Hatherley 2011.